Ed, that's a great collection. 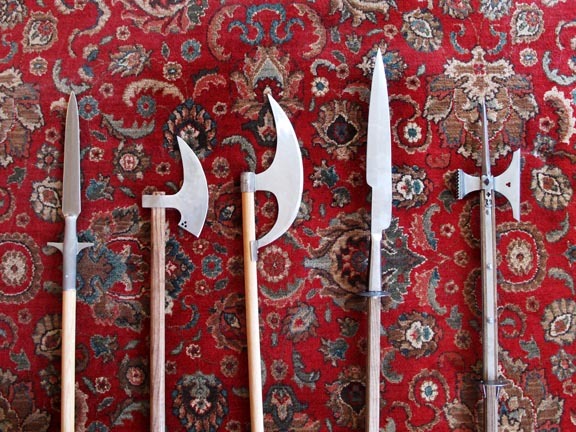 I especially like that sickle-spear. Do you know when they started using that weapon in Western Europe? The staff hook has been in use throughout Europe for over 2000 years as a hedging tool - basically a billhook on a long handle. This one is very close to some of the regional patterns of croissant found in France, just a little more open... (those from the Jura region to the east and the Landes to the west are very open). In the wine growing regions of France open blades sickles on both short and long handles were used to remove excess foliage from the grape vines to allow sunlight in to ripen the grapes. Similar tools were also used as eaves knives, to cut back the underside of overhanging thatch on a roof that could not be reached from the topside of the roof. 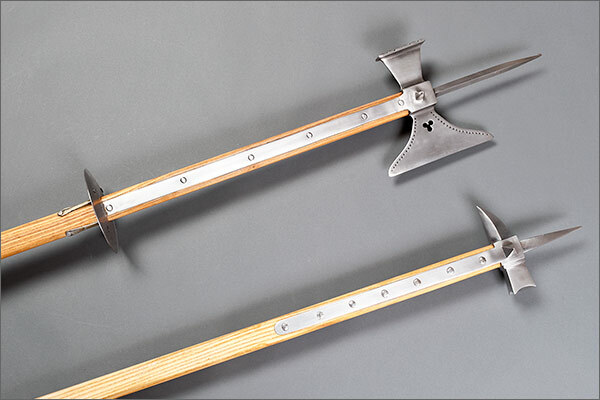 Those in the east of the UK have a straight blade up to 3ft (900mm) long mounted on a handle about 4 ft (1.2m) long or longer (depending upon the type of roof and the height of the building). In the west of the UK it is more like a straight sickle mounted on a short handle, and used from a ladder. My first full polearm after a pair of long spears. 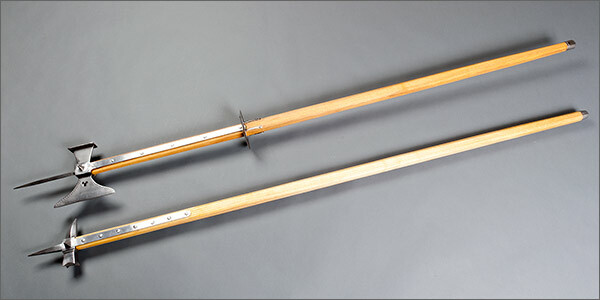 hanwei glaive head on a octagonal ash haft for a total length of 6'6. As far as I know, as a "war scythe" there are some very recent (19th century) examples, however Fauchards of similar design may have existed as far back as the 11th century. Let's get some new people sharing here! 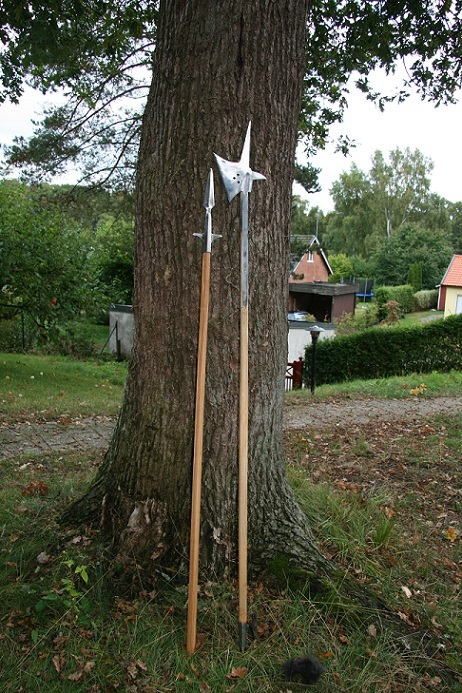 Here are two polearms assembled by Sean Flynt made from a Windlass warhammer and a GDFB poleaxe head. He discussed some of the project's progress in his topic and you can see more photos and discussion in my own topic. Hey, those are cool! I'd love to have another one of those hammers. Fun project! 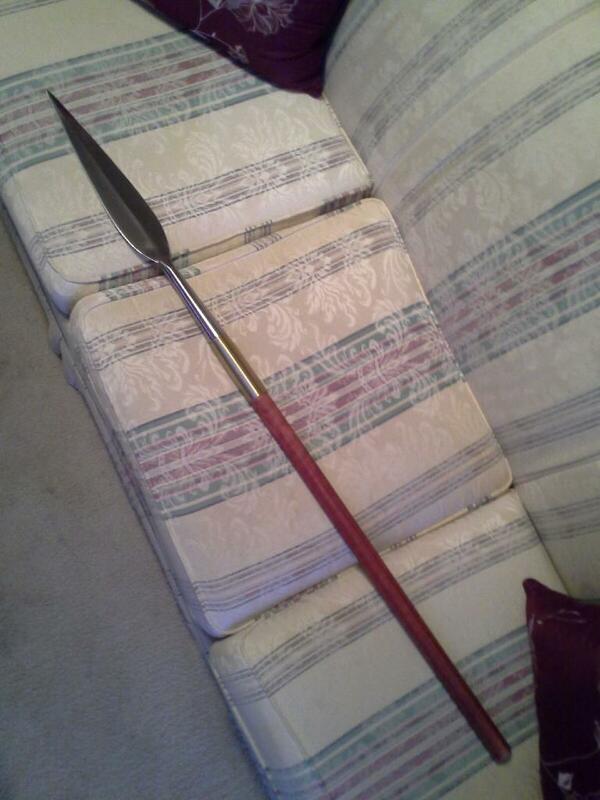 I need to post photos of the spear I built since it was sort-of part of that project. Posted: Sat 08 Sep, 2012 10:24 pm Post subject: My Lochabar axe by Adriaan Gerber. Here are some photo's of a Lochabar axe that I purchased from Adriaan Gerber, of http://adriaangerberknives.com/ last year. My only one at the moment, the Iklwa Zulu Short Spear by Windlass. so it´s a DIY project? nice. any details how it was made? did you weld separately axe, hammer and spike on a socket? and did you forge these parts, are was it done all by stock removal? I´m sorry for all those questions, but I´m planning something similar (although from a later period). thank you. Yeah, I made it myself =). The head is composed by 8 separate parts. Unfortunately all the pieces are welded together, maybe if I have the right equipment and skills I'll forge-weld it in a (very) distant future. The axe, the spikes and the hammer are all forged (especially the pattern on the back of the hammer, so fun to make with a chisel while the metal was hot). I have no idea of what kind of metal I used. The axe, the main socket, the quarter tubes and the hammer-spikes are all of different metals I found lying around in various places. So it is basically made out of scrap =). The socket is 5mm thick, next time I'll just use a much lighter section of a rectangular tube, instead of building it welding two "L". Hope I've been helpful =). My latest aquisitions in the pole arm department. I just love long weapons! 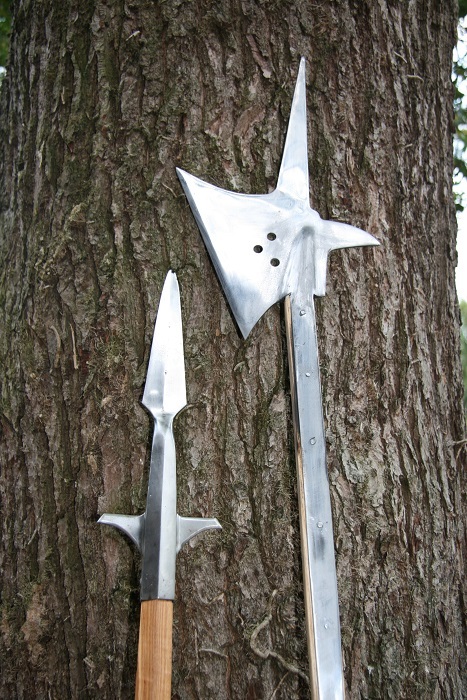 First and current star among my spears is "Boar spear of Cedric the saxon" Has it's own thread in the maker and manufacturer section. 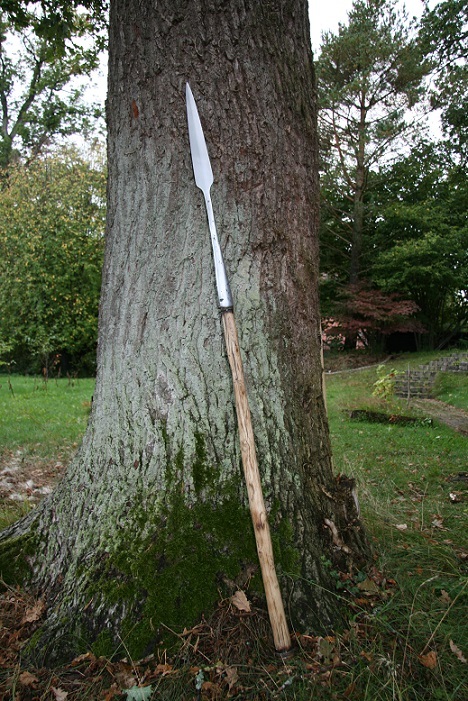 Second is a boar spear from Chech manufacturer Kovex Ars. Shaft is oiled ash planed to hexagonal section to match the spear socket by yours truly. 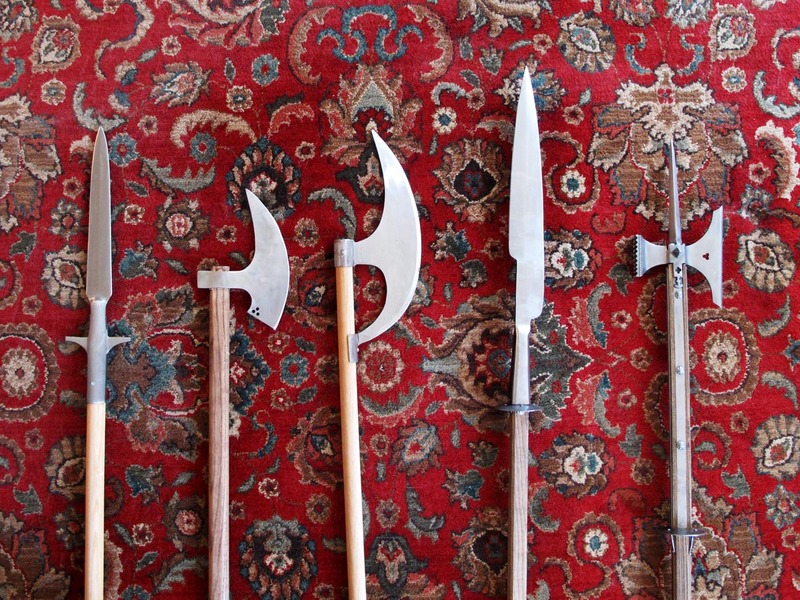 ^ These are some beautiful polearm, dude. 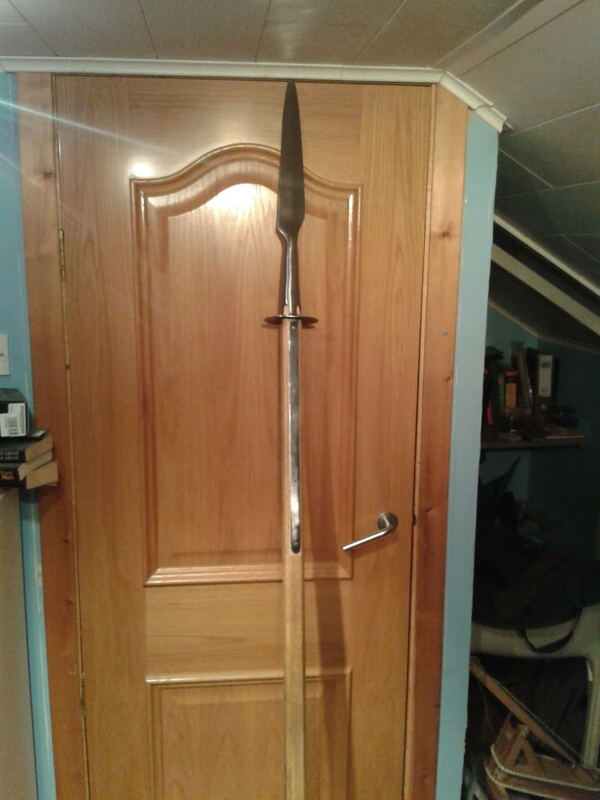 This is a bardiche that made out of 1045 carbon steel, based off the manuscript in 13 century. After making a couple of Type I maces, it was quite normal to obtain a Type II also. 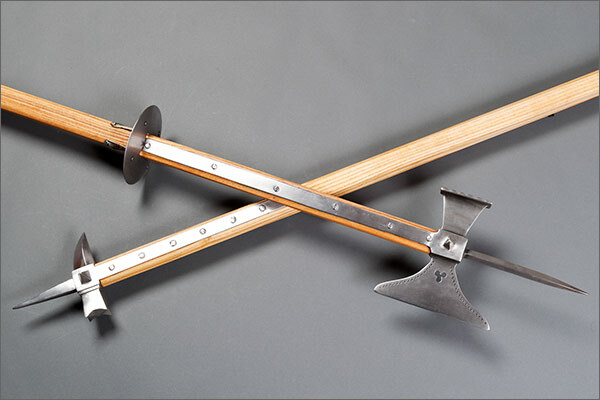 Note on Type II: In his book "Old Russian Weaponry (vol.2 - Lances, spears, battle axes, maces, flails - IX-XIII C.), Anatoliy Kirpichnikov classifies the maces with cube-shaped, corner-cut heads as "Type II"
Well, I made a wooden master and sent it to the foundry - there the head was cast. The rest was some sanding, re-shaping of the hole and hafting - really nothing serious. Say, any way to straighten a slightly warped staff? It's six foot by an inch and an eighth, Hickory. Boris: I very much like your mace! Nice work on the wooden master and seeing it through to having it made. Is it bronze? Do they still have the molds to use? You ought to pop out several and sell them. I would buy one. I have also seen some very nice work at Manning Imperial. They make use of bronze in a beautiful way.